I don’t think any of us really want to belong. We may say we do but that is taking the easy way out. It takes a bold person to be different and not everybody has that inside of them. Deep down we don’t really care about trends and what other people think; we just aren’t brave enough to stand up and say so… well most of us aren’t. Marc Darnell is the lead singer/guitarist/brainchild of the band Cupcake. Cupcake is anything but conventional, their style of music makes you feel uneasy in a wonderful way. Bassist Kiley Bodenhamer and hard pounding drummer Jeff Jensen mold the songs into grooves and keep the melody going just long enough for the listener to start to slowly nod their head or tap their foot; then Darnell and fellow guitarist Shardie, tear the rhythm of the song in half as unexpectedly as getting punched in the dark. Just as fast as the Pixies-style guitar changes started the band all at once blasts back into a stellar groove. The key to the band is Bodenhamer and Jensen’s ability to reel back in the songs from time to time. 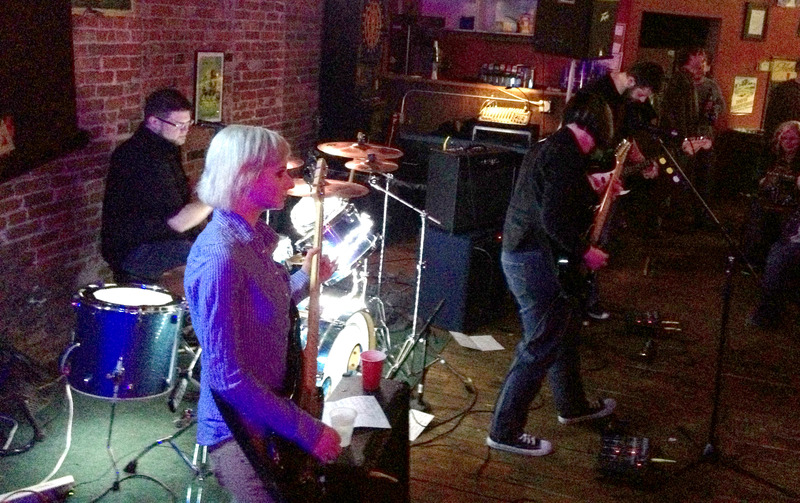 Cupcake playing live at The First Ward House in St. Joseph, Missouri on 2/22/13. 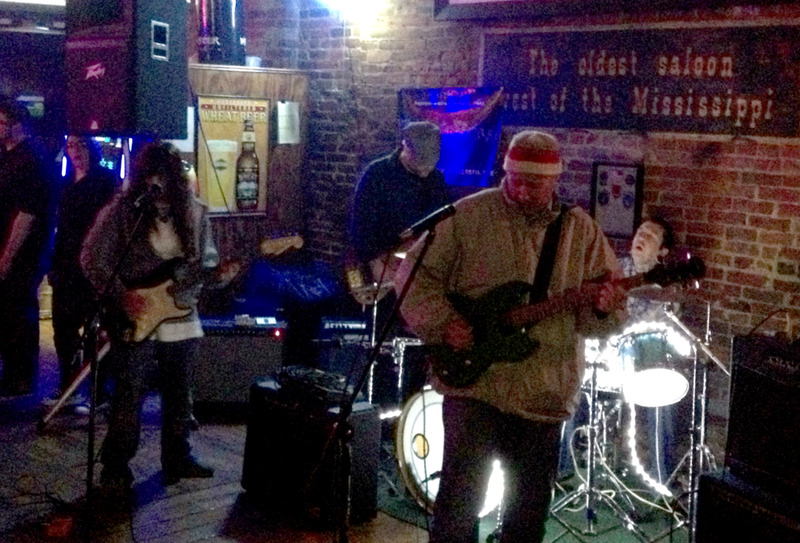 Left to right: Shardie, Kylie Bodenhamer, Marc Darnell,and Jeff Jensen. Cupcake operates in a rubber band mentality musically. They will stretch the rubber band as far as they can with craziness and habits of breaking rhythm then just before the rubber band breaks they snap back, all together, once again reassuring the listener that they knew what they were doing all along. As a frontman, Darnell is very unique, his stage antics are endlessly entertaining, ranging from his squatting while playing guitar to looking up at the ceiling. He will at times look totally uninterested in the task at hand and at other times shamelessly dive head first into what he’s doing and convince you that he simply could not be any more dedicated to the moment you are witnessing. Darnell drives Cupcake to be the wonderfully weird band that they are. Two Piece Animator had quite an act to follow after Cupcake left singed hair on the audience. They pounded into their set with some of the tightest music that is being played in St. Joseph right now. Still very new to the music they play, it is evident they are still refining their sound and trying to get all the hooks just right. The group of Garner Quillon on drums and vocals, Raye Lynn on guitar and vocals, Aerial on bass and Tyson Bottorff taking guitar leads appear to be dead serious about the new project. 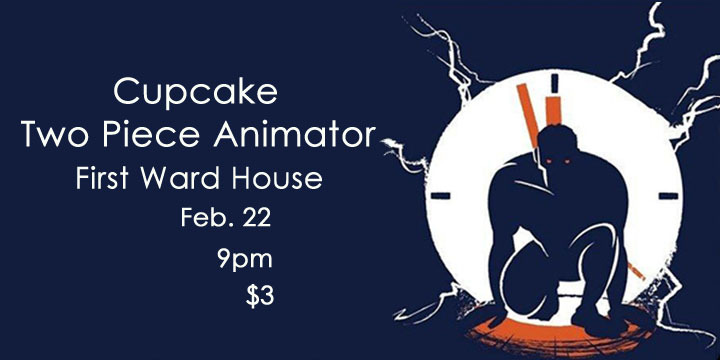 Two Piece Animator busting through their set at The First Ward House in St. Joseph, Missouri on 2/22/13. Left to right: Garner Quillon, Areal, Raye Lynn,and Tyson Bottorff. They powered through problems with the sound to put together another fine set. One song would even endure an unexpected and unrehearsed appearance by and unwelcomed 5th member of the band contributing on keyboards; that song would later end with a drumstick flying past his head and a clear message that he was not a welcome addition to Animator. The night would appropriately come to its conclusion with one of the band’s better songs “The End of It” where the band would finish the tune and take a moment to reflect on the weirdness that had just occurred. The sound for the night would be shaky at best. Most instruments sounded very good and the bands were tight but the vocals were always difficult to hear. The sound would be refined throughout the evening and get better with fresh input from an audience member. The show would be marred by silent vocal performances at times and microphone squeals at others. The bands can hardly be blamed for this though, as both of them seemed to be very good on the evening. Sometimes it is best when a night can be a parade of the weird and sometimes it’s good not to be normal. In the end, we all wish we were brave enough to not to fit in; we just don’t have the balls to do it. This entry was posted in Concert Review and tagged 2/22/13, concert review, Cupcake, First Ward, Garner Quillon, Jeff Jensen, Kiley Bodenhamer, Marc Darnell, Missouri, Raye Lynn, Shardie, St. Joseph, Two Piece Animator, Tyson Bottorff. Bookmark the permalink. There’s a plethora of douche bags. Great review.